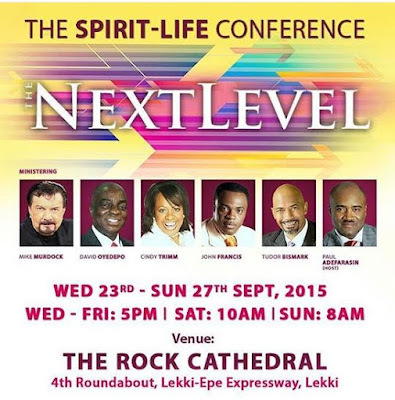 Few months before they host the world’s biggest gospel concert, The Experience Lagos; the House on the Rock Church announces yet another power packed program, The Spirit Life Conference scheduled to hold from Wednesday the 23rd to Sunday the 27th of September 2015. Alongside host and founder of the House on the Rock Church, Pastor Paul Adefarasin is a wide array of great ministers from across the globe which includes: Dr. Mike Murdock (The Wisdom Centre, USA), Bishop David Oyedepo (The Living Faith Church, Nigeria) Bishop John Francis (Ruach Ministries London), Dr. Cindy Trim (Former Senator, Best-selling Author and High Impact Teacher, USA) and Zimbabwe’s finest, Bishop Tudor Bismark (Jabula New Life Minstries, Zimbabwe). The Conference which has been aptly themed “The Next Level” is another way for the church to impact, empower and spiritually refresh thousands of attendees. It promises to be 5 days of overflowing blessings and insights. Coupled with empowering messages, there will be soul-lifting praise and worship experiences daily with various anointed gospel acts including Stellar Award winning artiste, Micah Stampley, Sonnie Badu, Nathaniel Bassey and the Lagos Metropolitan Gospel Choir (LMGC). Join the services at 5pm daily from Wednesday to Friday; 10am on Saturday and 8am for the Sunday Super Celebration Service. All sessions hold at The Rock Cathedral (House on The Rock Church), Lekki-Epe Expressway (4th Roundabout), Lagos.